The story is that you are an Octopus posing as a human father/husband with a wife and two kids. Despite your crazy slithering movement, only one person seems to have caught on: a crazed chef who wants to cook you. It’s a crazy story and the characters – while occasionally annoying – play their roles in moving the game forward well. 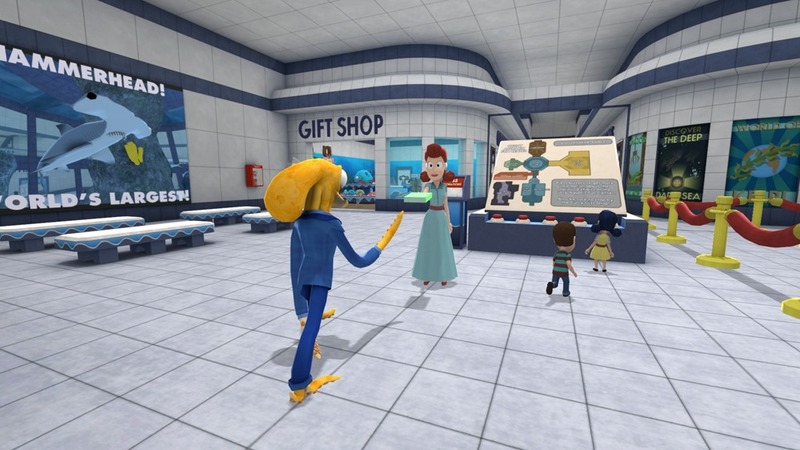 The story is nice but it’s the gameplay that will sell Octodad. You switch back and forth between controlling his legs or right arm (sorry lefties, he’s not an ambidextrous cephalopod), controlling their movement with the mouse. While in control of the legs, left clicking lifts the left leg and moves it around. The same goes for right clicking and the right leg, meaning that you will left click-drag-right click-drag to move around the world. While this sounds cumbersome, you can get pretty agile with practice. Switching to arm control allows you to move and point your right arm/tentacle around the world, shoving objects you hit, and picking up or interacting with things when you click the mouse. Some of the early domestic missions stand as my favorites, ranging from mowing the lawn to using the self-checkout at the grocery store. There is just something charming about the whole scenario. Sequences where you have to escape the mad chef or navigate small spaces are quick to frustrate due to the imprecision of the controls. There is just no way to move Octodad quickly and accurately. When you get stuck on the same corner, post or ledge for the umpteenth time, it starts to feel like the problem is with the level design and not your playing ability. The graphics are simple and cartoonish which fits the outlandish events (even if I’m not a fan of the human character designs). 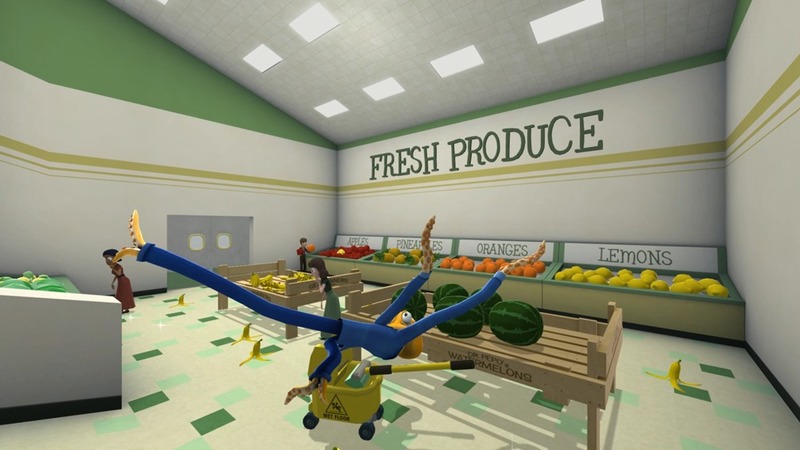 Octodad himself is very well designed and the movement animations are impressive. The only visual problem I have is the fixed camera perspective because at times it can require you move into areas you can’t see or hides key items out of sight. The sound effects are solid but the music is a highlight. I can’t tell you how many times I don’t care for – or sometimes even notice – background music these days but Octodad nails that aspect. As much as I like Octodad’s constituent parts, when it all comes together I’m left feeling a little let down. It doesn’t impress as much as it seems like it should and – while not long – it actually overstays its welcome. I think Octodad would have killed using the episodic style of Telltale Games’ Sam and Max series. Short releases every few months would serve Octodad well. As it is, Octodad: Dadliest Catch is a fun, unique game that is definitely worth trying out, if only for the experience.